Want to add an extra edge at training? Want to look stylish and intimidating as you perfect your technique? Well as always we have all of your needs covered at SideKick HQ as we unleash the new Cobra series of Muay Thai style boxing gloves and shin insteps guards. Boxing gloves come in the sizes 10, 12, 14 and 16oz, they are velcro fastening, made from genuine leather. The shin insteps are also made of genuine leather, they have 2 fastening velcro straps including underfoot support. Strike safely, strike like a Cobra, we are always in your corner. Want urban style? 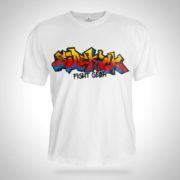 Then with this graffiti kickboxing set you will have the best street cred in the club. Comes complete with matching design 6 oz boxing gloves and shin Instep guards for a professional look. The 6oz boxing gloves offer all the protection your child needs with a padded hand mold and a velcro wrist strap to make your childrens hands feel fully secure. The shin guards give a great comfortable fit and fully secured with two rear velcro straps and an under foot support to prevent any unnecessary slipping. 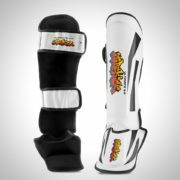 You also do not have to worry your child is kicking lightly, with these shin guards, it has a thick layer of absorbing padding so no strike will be felt to the shins. We have been specialising in child’s safety for many years so you can buy with confidence. 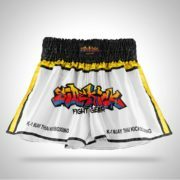 The kids Cobra series kickboxing set offers the ultimate style and full protection for Muay Thai and kickboxing. 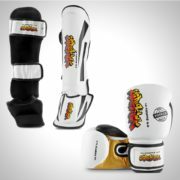 This set comes complete with the Cobra series 6oz boxing gloves and shin instep pads in a traditional Muay Thai style. The shin instep pads give full protection with comfort and support for maximum flexibility and mobility for those powerful kicks. The 6oz boxing gloves feature a velcro wrist closure for protection, comfort and an easy on/off design. By purchasing this set not only is your child training safe but also saves money too! Shin part measures 33cm. This set is perfect for children aged 7-12 years. Strike safely, strike like a Cobra, we are always in your corner! It’s called the ultimate for one reason….. Its the Ultimate! This ultimate 3.0 kickboxing set lives up to any expectations with its white, gold and black themed boxing gloves and shin guards. The Ultimate 3.0 boxing gloves are the pinnacle in boxing glove technology. These are our third and newest Ultimate model, proven to be even better than before! These boxing gloves are in a sleek, modern, dynamic design that contours the hands perfectly and will help improve hand speed and combinations. Made from a super durable cowhide leather in a real eye catching white, gold and black colour combination and detailed stitched to ensure they will last for years. These boxing gloves are also filled with a high shock reducing padding to absorb the most grueling of punishment. Sidekick Ultimate 3.0 shin instep pads are slim, lightweight shin pads have a 3/4 foot pad and are great for use in competitions or in everyday training. Made to withstand the punishment that Thai Boxing and kickboxing Practitioners put them through. Crafted from 100% cowhide leather and feature a looped Velcro strap closure for a secure and comfortable fit. The Velcro closures allow them to easily be removed and put on when training. A heavy duty elastic strap under the sole of the foot ensures full in-step safety and control. Made with the usual high standard stitching and craftsmanship we all expect from Sidekick products. Ultimate performance, Ultimate protection, The Ultimate!